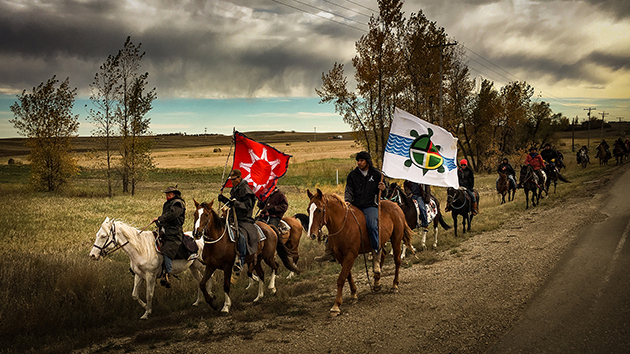 Mni Wiconi features water protectors from the Standing Rock Sioux Tribe and allies trying to stop the 1,100-mile Dakota Access Pipeline. Mni Wiconi ("Water is Life" in the Sioux language) doesn't aim to be an exhaustive document of the battle against this 1,172-mile oil pipeline. Rather, the film is an introduction to the conflict and the players at Standing Rock—"a primer," Read says. The fight isn't over, after all. On Monday, the tribe seemed to get a reprieve when the Army Corps of Engineers called for further analysis of the proposed pipeline route and consultation with tribal officials about their concerns. Standing Rock activists have declared Tuesday a "national day of action" against the pipeline, a project that is 95 percent complete despite the lack of the official easements and permits needed to finish it. Premiering here, Read's latest short film, Mni Wiconi: The Standing at Standing Rock, turns a camera on the plight of Native Americans, a group that has been neglected and wronged perhaps more than any other in this nation. "We were thinking of ways to continue the America Divided project with groups that weren't included in that series," Read says. "And I'd especially been thinking about poverty and inequality in Indian country." Responses to "Mni Wiconi (Water Is Life): The Stand at Standing Rock Movie"
Well done-moving & informative. Beauty & tragedy.